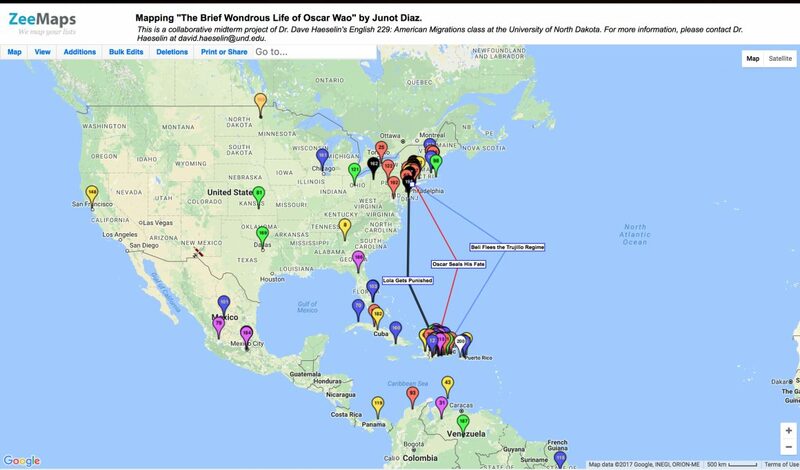 This article concerns a student project designed for a 200-level literature course titled “American Migrations.” Students used ZeeMaps (an application that creates custom maps using Google Maps data) to write entries about the 200-plus geographic locations mentioned in Junot Díaz’s novel The Brief Wondrous Life of Oscar Wao. Here I inquire how this non-software-intensive digital humanities project helped students fulfill the diversity general education requirement attached to the course. To that end, I argue that digital humanities assignments organized around questions of diversity can improve students’ understanding of difference while also helping them acquire practical digital literacy skills. Junot Díaz’s Pulitzer Prize-winning novel, The Brief Wondrous Life of Oscar Wao (2007), explores the porousness of many borders: national, linguistic, stylistic, and generic. The book tells the story of how a Dominican-American teenager, Oscar de León, learns to cope with being more at home in science fiction and fantasy worlds than he is in his own skin. To give this personal drama more reach, the book also looks backward to chronicle the tragic events that forced the de León family to flee the Dominican Republic and the bloody Trujillo Regime. Surprisingly, Díaz refers to locations from over thirty countries on six continents to craft his multi-generational immigrant narrative. The book also alludes to dozens of imaginary places from alternate universes well loved by Oscar. By any measure, Oscar Wao is novel of epic proportions.The global ambitions of this book can be off-putting, though. I worried about this issue after deciding to assign the book in a 200-level literature class which I titled “American Migrations.” This course, which I taught during the Spring 2016 semester, explored narratives of immigration to the United States and people’s movement once there. To help make sense of Díaz’s geographical references, I asked my students to map them (see Figure 1, Live Map and Appendix). 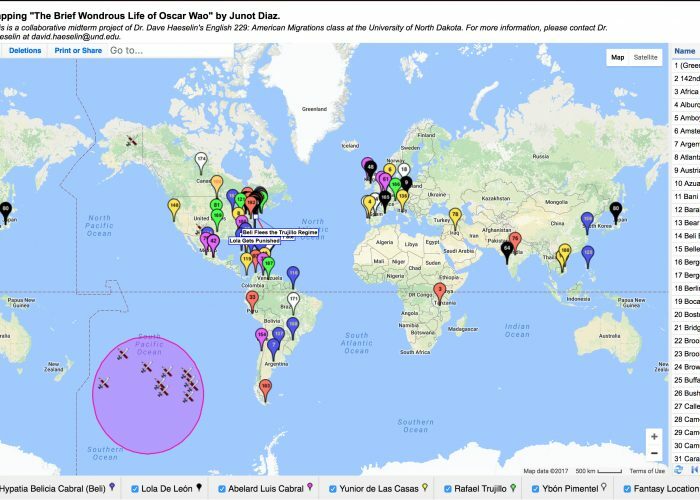 The course’s midterm assignment required students to plot Díaz’s 200-plus named locations using the ZeeMaps application, which allows users to create custom maps with data provided by Google Maps. In this essay, I will argue that this process of creating a collaborative map encouraged my students to construct pathways into the lifeworld of the novel’s characters and also out to the real world in which they all live. Incorporating a relatively small-scale, non-software-intensive digital humanities project into this lower division undergraduate literature course allowed students from many different majors to approach novels and their digital lives differently. Ultimately, re-reading the novel with the aid of this map ultimately permitted these students to transcend the inescapable frontier of reading literature: the gap between the author and the reader. Figure 1. “Mapping The Brief Wondrous Life of Oscar Wao.” The references are color coordinated to match the character most closely related to each reference. The crossed sword and pencils in the South Pacific Ocean represent fictional locations from Science Fiction/Fantasy, Comics, and Role-Playing mentioned in the novel. Promoting diversity is an integral concern of contemporary university education. Many citizens, faculty, administrators, and even students themselves demand university populations that more accurately and fairly represent people from all backgrounds. Moreover, scholars and activists have concentrated on using required courses, particularly in the humanities, to introduce students to the stories, struggles, and perspectives of these groups. In the past fifty years, the concept “diversity” has evolved into a required learning outcome of many general education curricula (Chang 2002). In English departments, this means changing what books are taught, how they are taught, and who gets to teach them. That said, diversity is just one of many popular general education requirements. My university also expects students to complete classes that meet advanced communication and information literacy requirements, and rightly so. I responded by attempting to design an assignment that would help prepare students for the demands of information work in the global economy. I chose to explore racial, national, and geographic diversity by teaching a novel about immigration written by a person of color, and then framing our interpretation of it using questions of distance, distance that can be easily mapped using digital applications. Google Maps tells me that the classroom in Grand Forks, North Dakota where I taught this novel is 1,498 miles from Oscar’s (and Díaz’s) hometown of Paterson, New Jersey; their birthplace, Santo Domingo, Dominican Republic, is 2,543 miles as the plane flies (see Figure 2). Suffice it to say, the majority of my students grew up in a very different world than Díaz and his characters. Few of my students came from urban centers, or even large towns, and the only immigrant of the group moved from Manitoba in Central Canada when he was very young. More importantly, none were born in Grand Forks. I know all of this because the first assignment in the class was a short, written reflection on each student’s idea of home. I came up with this task as a way to encourage my students to take their own identity seriously within larger national and international contexts. Because all of them had moved to Grand Forks, they too had migrated, albeit under different circumstances. I suspected that the drama of leaving home in the course’s narratives of immigration would resonate more clearly after students were allowed to describe how they visualize and construct their own sense of their origin. Their work over the course of the semester confirmed this suspicion. It is worth noting here that the racial make-up of the class was relatively homogenous. Most students appeared white with the exception of three students that appeared to be of Asian descent. There were about as many male-identified as female-identified students. Figure 2. “Major Character Migrations.” The three main journeys made by the main characters are marked with solid lines. Notice the scarcity of references to the Midwestern and western US, from where many of my undergraduate students hail. The lone location in the upper Midwest is the University of North Dakota, which I placed on the map for the students’ reference. Our class-wide discussions afterward indicated that creating the map enriched students’ experience of the book. The class was particularly diverse in disciplinary backgrounds. Its twenty-four students came from eleven different majors, unified chiefly by their desire to fulfill one of the two diversity requirements that they need to graduate. My course covered the “U” requirement, which is explained in the course catalog as a special emphasis in United States diversity. The class roster included more aviation majors than English majors. This disciplinary diversity added a level of complication in designing and implementing a digital humanities project in the course. Not only could I not presume these students would be confident interpreting literature and writing about it in the ways I would require them to, but I could also not expect them to have any experience with any software packages besides ones that are freely accessible and widely used. 56.4% of smartphone users rely on Google Maps to navigate through space (Statistica 2017). Anecdotal evidence suggests that my students’ usage was even higher. By filtering our reading of the novel through an interface that most of my students use regularly, I hoped that Díaz’s characters and their exploits could become more real and realistic to them. As this argument progresses, I hope to show how my understanding of how to best teach literature about diversity evolved alongside my strategies for implementing digital humanities assignments. Now, let me provide an overview of the goals and proposed learning outcomes of the assignment. In the most basic sense, maps help us make sense of the meaning of borders. Digital maps add functionality by modifying and filtering the data presented to individual users based on their specific needs and queries. A real-world example of this would be how Google Maps includes customer reviews and hours for restaurants as well as the time it takes to travel by car, foot, bike, or public transit from the user’s present location. For the purposes of this lower-level literature class, I wanted my students to seek out details that would flesh out the daily lives of characters living in the world of the novel. I asked pairs of students to research a set of locations, plot and describe each location, note which character was most important to this reference, explain the location’s relevance to the overall plot, and then check each other’s work. I provided a step-by-step guide (see Appendix) to filling in the fields that I created using the ZeeMaps application. Nevertheless, a few students struggled to make the software work in ways they wanted it to, and thus I had to provide some training in fundamental digital literacy skills. This kind of support falls outside the purview of my explicit course and project objectives, but I consider it time well-spent nonetheless. After looking through the various mapping application options, I chose ZeeMaps because it offers a straightforward, easy-to-use interface, and because it creates maps that look similar to Google Maps with which my students were already familiar. I decided against more complex applications (such as MapBox) for two central reasons: their steep learning curves threatened to intimidate students, and, more importantly, their flashy, fiddly maps might distract from a main goal of the assignment, to bridge “foreign” world of the novel to the “ordinary” digital lives of my students. As you can see in the assignment sheet (see Appendix), I structured the steps in straightforward as possible ways for students coming from many different educational backgrounds with varying degrees of digital literacy with software tools. Put another way, I tried to refocus the quotidian practice of on-the-fly smartphone research as a means to learn about the world of the novel’s characters, not the world of the students themselves. Figure 3. “Franklin Diner (Somerset Diner).” A representative example of my student’s entries. Students’ names have been removed to preserve their anonymity. The above entry (Figure 3) is representative of my students’ work. First, I will discuss some positive aspects of this example. When this student failed to find an obvious match for the diner mentioned by in the novel among his assigned locations, he returned to the text and used an interpretation of the character’s motivations to come up with a suitable substitute, reasoning that the diner should be “known to be a local hangout.” This phrasing demonstrates a clear identification with Oscar as college student like himself. In having to extrapolate in this way, it seems to me that student was compelled to compare his own motivations and experiences to the character’s. What’s more, this student returned to the text of the novel to ascertain the necessary context to address his hermeneutic challenge. Re-reading is a foundational analytical technique of all college English courses from Freshman composition onward but considering that most of my students were not English majors, I was heartened to see this student revisiting this passage to meet the expectations explained to him on the assignment sheet. Here, this student used his interpretation of a minor choice by Díaz to better explain Oscar’s decision-making. Next, I will address what could be have been improved. I was disappointed to see that students’ writing in the project often came across as casual, even sloppy. This example highlights the class’ wider writing issues. Rutgers is misspelled, for instance. This particular student begins to analyze the choice of setting this scene in a local diner but fails to use the connection he makes to advance any claim about Oscar’s place in the narrative or directly connect it to his own experience. Overall, my students’ analysis was not nearly as rigorous as I had hoped given the complexity of the novel. Some locations are of more interest and import than others, of course, but I had anticipated that requiring them to investigate important and minor places alike, students could get a richer sense of the writer’s craft. Our class discussions afterward suggested that some students understood this idea better than their entries demonstrated, but I had wanted to see this more explicitly in their writing. As I will discuss below, I think that asking my students to write a bit more “around” the mapping assignment may have enriched their analysis and their textual engagement with the novel. What often sets English department classes apart from other college courses is the attention paid to writing itself. This assignment (indeed, all assignments of this nature) threaten to distract students and instructors from attending to prose. At risk of oversimplifying an important debate for the benefit of a quick summary—more time spent with software means less time writing (Bosquet 2014; Schuman 2013). This is a valid concern, but one that I think this assignment and assignments like these can overcome through careful planning. That said, literature classes offer something more than writing and argumentation alone; they offer stories as compelling examples of lived experience. Getting students from a variety of majors to recognize this and develop a working understanding of the point of literature, if not a whole-hearted appreciation of it, must be an implicit goal of literature classes’ reading lists and assignment design. I planned this mapping assignment with that in mind, and I think, for the most part, it succeeded. Student research methods suggested another possible shortcoming. Perhaps not surprisingly, many of my students conducted their research for their location entries with Google and Wikipedia even though I warned them that exclusively using these sources would undermine the accuracy of their work and, thus, my assessment of its quality. I accepted this trade-off because I predicted that this assignment would remind my students that these places mentioned by Díaz are inhabited by real people in the real the world. ZeeMaps’s close emulation of Google Maps directions interface likely pushed students towards repeating their regular “research” strategies. Rather than force them to behave like scholars, I tried to twist this possible danger into a moment of identification with the characters. Literary scholars know better than to confuse quantity for quality, but students may not. With the completed map in front of us during our classroom discussion, students could begin to see how things mentioned only once, or even not at all, can impact the meaning of a text far more than things often repeated. Interpreting the motivations of characters, just like the motivations of real people, requires reading also what is not there. The hermeneutic method required to complete this mapping assignment therefore offers different ways to frame lessons that we already want to impart to our students. This project also reminds us of a lesson so obvious that it is too often forgotten: diversity comes in many different forms. The student-readers start off as distant from the lives and experiences of these characters, but once they have started to transcend that distance, they are able to be more receptive to the many other lessons about the difficulties of immigration, race, and authoritarian governments that Díaz builds his narrative upon. By the time a contemporary student reaches university, she has undoubtedly been told about the importance of diversity; she may even be sick of the hearing versions of the same platitudes. I’d argue that the humanities are uniquely suited to succeed at overcoming this danger. Combining diversity education and technological literacy in many lower-level classes could offer ways to help students feel more connected, both in geographical and mediated terms. I do not claim to have produced a heightened sense of literary appreciation in all of my students, but I am confident that seeing these characters and places in this new way helped them develop a more cosmopolitan ethical outlook, putting them on the path toward what Viet Thanh Nguyen calls a “citizen of the imagination” (286). Reading literature alone does not make you into a good person, but it does force you to imagine the lives of others living on the other side of spatial, psychological, and cultural borders. Applying common digital applications to the study of any human problem offers more students the possibility of participating in this kind of community in ways they are already comfortable doing, namely navigating space with digital maps and looking up unknown references on the internet. No matter how you decide to approach it, there is a lot going on in The Brief Wondrous Life of Oscar Wao. Indeed, readers such as Kim Flournoy have created digital supplements like “The Annotated Oscar Wao” to help readers deal with the many untranslated Spanish words and the abundant geeky references. Rather than address this interpretative difficulty, the mapping assignment required students to come up with their own explanation for narrative details such as why Díaz might have his character apply to NYU knowing full-well that it was a “one-in-a-million shot” before choosing to attend Rutgers, the State University of New Jersey (33). Providing a rationale for the minor elements of the story seemed to help them grapple with central ones. Through this type of inquiry, Díaz’s characters stopped being just symbolic representations of something larger than themselves; they could start to become humans who the students could identify and sympathize with despite their clear biographical and geographical differences. After we completed our group map, I asked the students to consult the artifact and compose a written reflection on how it affected their understanding of the novel they had already “finished” reading. One perceptive student concluded that the class was “forced to kind of abandon the stereotypes of where we pictured these locations or what we pictured them as, because we were searching for more information about these places.” By engaging Díaz’s fictional world using the same digital protocols they normally use for things as trivial as finding where to get a cup of coffee or some late-night Mexican food, my students could more easily identify with his characters, and, perhaps, start to see them as peers. From reading student responses like this one, I came to appreciate a crucial oversight in my assignment design. By asking students to write a reflection about the novel only after completing the map, I may have neglected an opportunity to trace how their feelings about the novel changed in the process. Next time, I would try assigning an additional response to the novel before introducing the mapping project. Even a piece of writing as short and straightforward as a review modelled on a Goodreads post or Amazon customer review would have given students the chance to articulate their feelings of the novel at that point so they could later revise them. Indeed, perhaps this missing link is one reason why this student above hedges, using the phrase “to kind of abandon” stereotypes rather than critical thinking vocabulary such as “revise” or “complicate.” Of course, many of our classroom discussions gave students a preliminary chance to voice their responses to the novel, but a more comprehensive and formal opportunity may have made the discoveries and arguments explored in the final reflection that much more helpful. Many college courses designed to meet diversity general education requirements surely state goals that sound similar to my student’s description above—particularly the part about challenging stereotypes. What this mapping project offers above and beyond that, however, is the process. The characters and the locations students explored with their map became situated in reality, thereby reinforcing the overall goal of asking students the recognize the shared aspects of the human experience. This humanizing of unfamiliar characters was additionally useful since Díaz’s style veers so widely from the traditional methods of literary realism. Mapping offers a supplementary reading strategy which fuses the power of Díaz’s linguistic experimentalism with realism’s concern for the motivations of living, breathing people, not too different from those who really do exist, in identifiable settings. There is great potential for incorporating digital tools, methods, and assignments to help accomplish the traditional goals of undergraduate literature classes that include non-majors and non-experts. Here I want to elaborate how digital humanities teaching methods can advance the goals of traditional pedagogy in the humanities and the liberal arts, and, what’s more, can help students better see the purposes of writing for digital environments. For his part, Ryan Cordell stresses the creative and imaginative promise of skill-building as encouraging broader humanistic engagement. It “is one thing to be able to use a particular piece of hardware or software,” Cordell suggests, “and another thing altogether to imagine what it might do or mean if pushed beyond its typical use, or even more again to imagine what might be created in its stead.” I read Cordell’s argument as pushing instructors to think about innovation in the creative economy more broadly. We must remember that knowledge work, especially in the creative industries, is already software-based. Digital tools and software evolve rapidly, far more rapidly than any departmental curricula could, but this does not mean that English instructors should throw up their hands. It is important to recall that undergraduates, even so-called digital natives, are primarily users of technology, not designers or programmers; there are thus technological and psychological barriers to the kind of “imagining” Cordell describes above. Employing these skillsets with tasks that students already have some fluency in, such as digital maps, may help erode some of their anxiety concerning digital assignments and computer-based knowledge work while also introducing them to stories and perspectives of people different than themselves. To my mind, moving digital humanities projects into lower-level literature classes offers students productive ways to develop their ethical and pragmatic digital selves at the same time. Digital interpretation techniques have become increasingly powerful and popular in recent years. It should come as no surprise, then, that scholars have experimented with using this kind of method on Díaz’s important novel. Ed Finn, for one, scoured and compiled Amazon reviews of Oscar Wao to try and make sense of Díaz’s complex set of influences and references in order to better understand his place in the literary field. To that end, Finn used Amazon’s subsequent algorithmic recommendations to explain how Díaz’s network of authors and texts affect real reading habits of customers and fans. Finn contends that the novel is “ultimately a story about reconfiguring reading.” This claim makes good sense, given the vast array of literary and genre references within the text, but, I would add that mapping Díaz in the ways my class did permit us to take Finn’s argument one step further. Finn explains his method in spatial terms: “Like Díaz,” he seeks “to redefine reading by expanding the contested territory.” Here Finn speaks of territory only as a metaphor. He employs what we might call a “distant reading” of literary texts that, following Franco Moretti, allows him to “focus on units that are much smaller or much larger than the text: devices, themes, tropes––or genres and systems” (48–9). My mapping assignment, on the other hand, asked students to read distance, and thus, find ways to overcome the feeling that they share little with the characters in this novel. At this moment, it is important to consider Lauren Klein’s revaluation of the technique after Moretti’s public accusation of sexual assault. She concludes that “it’s not a coincidence that distant reading does not deal well with gender, or with sexuality, or with race.” Here Klein reminds us that literary value is never neutral, and thus demands that digital humanities scholars continue to question the literary canon that is (re)produced by newly available research methods. Projects which examine the particular challenges that persons of color face in the contemporary literary marketplace such as Finn’s are a start, but digital humanities research needs to keep improving on this score. Incorporating mapping projects in classes “about” diversity could be a productive point of departure. Finn’s claim that both his method and Díaz’s novel force us to read differently is obviously an exciting one for literary scholars; we read professionally. Students and other lay readers (many of the critics that Finn taps in his analysis of Amazon reviews for that matter) do not necessarily share the same imperatives for reading literature. Many students are familiar with digital product reviews; many have even tapped them for recommendations about all kinds of goods. However, extrapolating Amazon’s sense of the literary marketplace onto, say, Pierre Bourdieu’s conception of the literary field that Finn relies upon requires theoretical background that many undergraduate students, including English majors, lack. This is a way of saying that many of the goals and objectives of humanities research, especially digital humanities research, remain opaque to even advanced humanities undergraduates. Furthermore, they surely remain hopelessly abstract to undergraduates outside the humanities who struggle to grasp the learning objectives of humanities education. The success of my students’ work in this context reinforces the argument that instructors can offer our students the benefits of the digital humanities research methods without having to explain them as such. Consider Mark Sample’s definition of creative analysis: “I don’t want my students to become miniature scholars. I want them to be aspiring Rauschenbergs, assembling mixed media combines” (405). 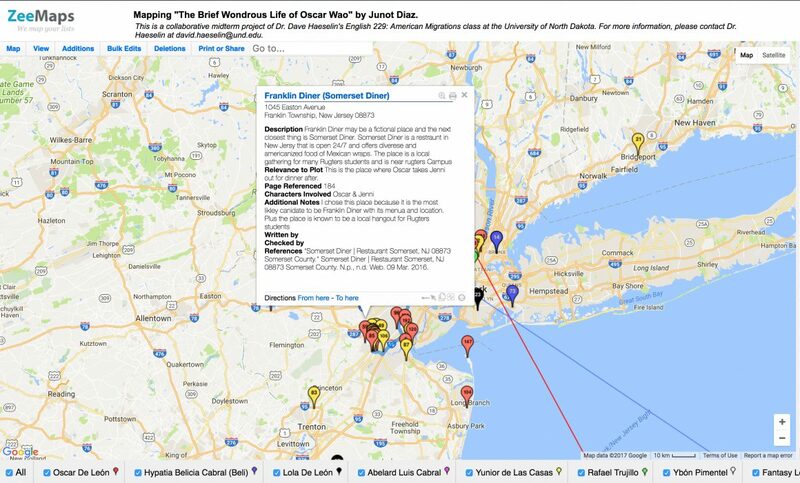 In projects like this mapping assignment, instructors can offer techniques that offer new lines of creative inquiry for students interested in literature, art, and creative practice without alienating students from other disciplines who have enrolled in the course for the chance to read some good books. Put another way, digital assignments like this offer students from a wide variety of majors the chances to actively participate in the information economy as creators and designers, not just as passive users. At the same time, assignments like this reinforce the idea that creativity requires careful observation, research, and analysis, not just ego. Writing papers have long modelled this strategy for future workers and citizens within the safe confines of a classroom and with a receptive audience of one teacher. Mapping projects, on the other hand, enable students’ products to circulate and serve others in ways that real-world writing and maps already do. This is not to say that mapping should replace writing, but it does seem to offer an exciting supplement to students who may not have as much experience or interest in artistic products and process as humanities or arts majors. Undergraduates, especially non-English majors, will only read so many novels during their academic careers. Junot Díaz’s The Brief Wondrous Life of Oscar Wao addresses many of the objectives of English department curricula and will hopefully continue to be a mainstay. The accusations of sexual assault and misogyny made against Díaz surely complicate this wish. To my mind, interpretive methods that prioritize culture, context, and the reader rather than the author, are designed to expose sexual, economic, racial, and imperial violence in ways that may foster the kinds of difficult discussions that will help eradicate these kinds of violence; Díaz’s text was already problematic, and these disturbing allegations reinforce just how important discussions of difference should be moving forward. What the creation of this mapping assignment taught me is that the novel’s planetary ambitions are as important as supplementing of the reader’s “mandatory two seconds of Dominican history,” which Díaz lampoons in the novel’s first footnote (2). Indeed, Oscar Wao would not be as canonical, that is, it would not appear on as many undergraduate syllabi, if its concern with space were not so robust. Mapping this novel by digital or cognitive methods reinforces a central takeaway of Díaz’s fiction—people and their cultures do not travel on one-way trips or in straight lines. My students got the chance to discover where the undergraduate reader, where each of them, fits into this landscape. As productive as I found this assignment to be for my students, I think that in my desire to make it straightforward for a varied group of students may have undercut some of the project’s efficacy. For instance, I may have erred by creating the spreadsheet of locations for the students, so that they could simply plug in the locations using the ZeeMaps interface. I did this to make sure that students would not miss any locations, and to make sure that they would all get an even amount of work, but I fear that it may have been too easy for students to simply search for locations out of context. On a related note, if one wanted to adapt this assignment onto a different novel in a similar class, I would suggest having students map their own migrations from home as a way to cement the connections between their own lives and the lives of the characters. ZeeMaps makes it easy to group locations, so these locations could be easily unchecked, and thus made invisible, for the sake of class discussion about the novel itself. Since this assignment was designed around fostering student identification, reinforcing how far they had travelled (in terms of psychic and physical distance) may help expand the lessons of the class, the project, and the novel. At their best, humanities courses help students see things in new ways. The digital humanities should share the same imperative. With assignments like the one I detail here, humanities instructors may defamiliarize the common and familiarize difference. By eclipsing the frontier between the singular experience of reading and the real-world novels attempt to represent, readers can begin to create a higher relief image of the things that should be all but borderless: our imagination and our empathy. I did not directly relate this reflection on students’ ideas of home to the midterm mapping project, but, as I elaborate upon below, I think the next time I assign a mapping project I will aim to frame the purpose of the project a bit differently. Perhaps the best part of using ZeeMaps is the ease of creating posts. All users need to do is find the “Addition” tab and enter a location and type it in, just as if they were searching for driving directions. ZeeMaps’ reliance on real-world maps via Google, however, made the addition of the dozen fantasy references difficult to chart (See Figure 1 or the South Pacific Ocean on the live map). This discrepancy required students to further consider the “reality” of Díaz’s references. Bousquet, Marc. 2016. “Keep the ‘Research,’ Ditch the ‘Paper.’” Chronicle of Higher Education, February, 14 2014. Chang, Mitchell J. 2002. “The Impact of Undergraduate Diversity Course Requirements on Students’ Racial Views and Attitudes.” JGE: The Journal of General Education. 51, no. 1. https://doi.org/10.1353/jge.2002.0002. Cordell, Ryan. 2015. “How Not To Teach Digital Humanities.” http://ryancordell.org/teaching/how-not-to-teach-digital-humanities/. Díaz, Junot. 2007. The Brief Wondrous Life of Oscar Wao. New York: Riverhead. Hanna, Monica, Jennifer Harford Vargas, and José David Saldívar, eds. 2016. Junot Díaz and the Decolonial Imagination. Durham: Duke UP. “Mobile Audience Reach of Leading Smartphone Apps in the United States as of June 2017.” Statista.com. https://www.statista.com/statistics/281605/reach-of-leading-us-smartphone-apps/. Nguyen, Viet Thanh. 2016. Nothing Ever Dies. Cambridge: Harvard UP. Phillips, Kristine. 2018. “Pulitzer Prize-winning author Junot Diaz accused of sexual misconduct, misogynistic behavior.” Washington Post, May 6, 2018. https://www.washingtonpost.com/news/arts-and-entertainment/wp/2018/05/05/pulitzer-prize-winning-author-junot-diaz-accused-of-sexual-misconduct-misogynistic-behavior/?noredirect=on&utm_term=.6b43cdd95ae0. Sample, Mark. 2011. “What’s Wrong with Writing Essays.” Debates in the Digital Humanities. edited by Matthew Gold. Minneapolis: University of Minnesota Press: 404–405. Schuman, Rebecca. 2013. “The End of the College Essay.” Slate, December 13, 2013. http://www.slate.com/articles/life/education/2013/12/college_papers_students_hate_writing_them_professors_hate_grading_them_let.html. This assignment asks you to think about Junot Díaz’s novel in a different way than we did My Ántonia. Rather than interpret the text of the novel itself, for this project we will create a visual representation of the Dominican diaspora by building a digital map. 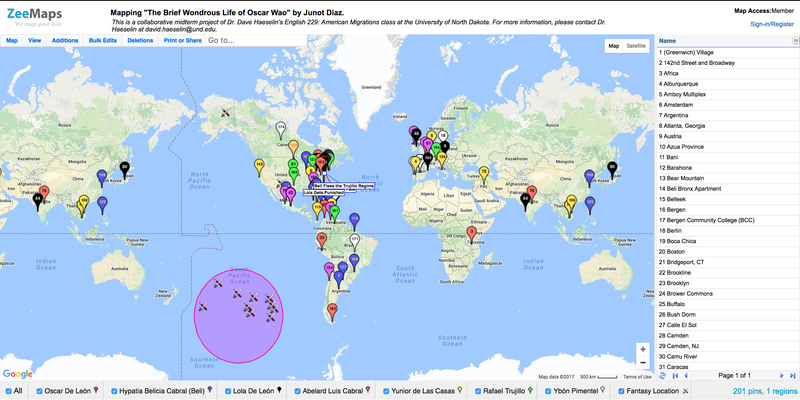 This map will try to represent the “mental geographies” of the novels’ characters by marking the 200 places referred to by Díaz over the course of the book. Once we have completed this collaborative assignment, we will use this object to help us better understand the scope and meaning of this impressive work of fiction. This assignment will be completed with a partner. I have already listed the 200 or so locations that Díaz refers to in the novel. I will divide them up and send you a spreadsheet with your set of locations. You are your partner will be responsible for inputting all of these locations on our map using the web application ZeeMaps (follow the link on the Blackboard Site under Tools). Create a username for posting material on the ZeeMaps web app. Please select a name that you don’t mind sharing publicly on the Internet. You can use your real name or a pseudonym, it’s entirely up to you. I’m going to use david.haeselin. E-mail me your chosen name. Go to ZeeMaps.com and sign-up. You can use your UND e-mail, if you like. Please select a password that you won’t have trouble remembering. Follow the link to the editable Oscar Wao map I’ve posted on Blackboard under Tools. Open ZeeMaps make sure that your browser can run the app. Check your e-mail for your assigned list of locations in a spreadsheet document. Divide the locations listed on the spreadsheet between you and your partner. Look up an assigned location on the Internet. Draft a sentence or two long description of the place in the spreadsheet file. Be sure to provide attribution for whatever source you decide to cite. Include a sentence of two long description of the place’s relevance in the novel. Find the passage and include a short citation from the text of the novel. Fill out all other applicable columns in the spreadsheet (e.g. relevance, allusions, relationships to other places). Figure out which characters participate in this section of the text and include it in the spreadsheet. Select which character is most related to this reference. Enter the proper MLA citation of the source you found in the Works Cited column in the spreadsheet. NOTE: Before editing the map, I ask that you re-read the pages you were assigned and make sure that you have accounted for all of locations Díaz includes. Duplicates are fine, I want this map to be complete as possible. If you do find an extra location, add it to your spreadsheet and follow the above steps. Follow the link to the map included on the Blackboard site. Enter a location and let the app find it for you. Add the appropriate entry name. Select the appropriate color to match the character as explained on the Oscar Wao Codes Assignment sheet posted on the Blackboard Site. Find your marker on the map and double-click it. Select the “Details” tab and add the additional information contained on your spreadsheet. Enter your username in the “written by” field. Select next location and repeat for all locations assigned to you. For an example, see my post for Santo Domingo de Guzman. Please submit all of your locations to the class map by Friday, March 11. Please also submit your completed spreadsheet via the link on Blackboard. You will be graded according to the accuracy and quality of the information about your submitted locations and spreadsheet. They should match and provide useful additional information to the reader. Once completed, you will submit a short 2-page essay describing how the completed map confirms and/or complicates one thing you thought you knew by reading the novel. This will be due Wednesday, March 23 and will account for 25% of the total grade for the assignment. Each student will submit their own unique essay. David Haeselin teaches in Writing, Editing, and Publishing program in the English department at the University of North Dakota. His writing has appeared in Hybrid Pedagogy, Critique: Studies in Contemporary Fiction, The Los Angeles Review of Books and Tin House Online.